Adobe Photoshop is a powerful photo-editing application. With Adobe Photoshop, you can do everything from touching-up photos to creating original artwork. Some tasks, however, can be quite repetitive. When you are cropping and resizing hundreds of photos, for instance, you don’t want to spend hours opening each individual file, applying treatments, saving and closing. If you find yourself regularly doing the same tasks, we will show you how you can easily record those actions and play them back at the touch of a key. 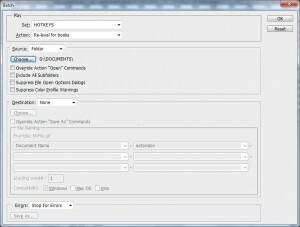 You can even apply actions to entire folders of files and save yourself a lot of time. Actions Panel: Here you see your list of actions, and create and record new ones. 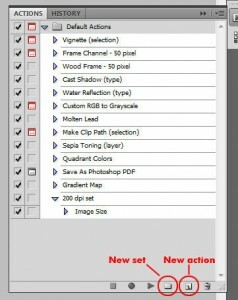 You should see a list of default actions that come standard with Adobe Photoshop. You can play with those if you like, but here we’re interested in recording our own actions. I like to keep things tidy, so let’s start by creating a new folder. Click the folder icon at the bottom, ‘Create new set,’ and enter a name. I have one named ‘Hotkeys’ for all my in-use actions. Create a new action now by clicking on the ‘page’ icon next to the folder, “Create new action.” This will pop up prompting you to name you action, set the action’s folder, set a function key and begin recording. You can also give the action a color to organize actions or just spice up your actions panel. Anything you do in Adobe Photoshop can be recorded here and played back again either by pressing the ‘Play’ button in the Actions Panel or pressing the function key (F2~F12) if you assigned one here. Any function key that is already taken won’t be available. So, for example, I already have an action that uses ‘F4’, so if use ‘F4’, when I select that key, ‘Shift’ is automatically selected. If I try to unselect it, ‘Control’ automatically selects. So I can use either ‘Shift+F4’ or ‘Control+F4’, but not ‘F4’. You can also select both to set it to ‘Control+Shift+F4’. It’s pretty fail-safe, so don’t worry. You can change any of these settings later if you want. Create a new action. For this example, I’m creating a ‘Crop to Bounds’ action. This action is useful when working with transparent logos or any image/artwork that has transparent dead space that you need to remove. Hit ‘Record’ and do your task as you normally would. For our ‘Crop to Bounds’ action, we want to select the non-transparent area. Here we have PNG logo file open. Open your ‘Layers’ panel (F7) and hold ‘Control’ while clicking on the layer preview. In Adobe Photoshop, this is method for selecting the visible bounds of a transparent layer. ‘Control + Click’ on the layer preview in the Layers panel. The visible part will now be selected. 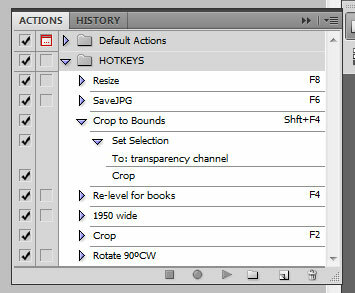 Next select ‘Crop’ by going to the menu, ‘Image > Crop’. Go back to your ‘Actions’ panel and click the ‘Stop’ icon on the bottom (next to the ‘new set’ and ‘new action’ buttons you clicked earlier). Now you should see your new action on the list. If you want to change the name or hotkey, double-click next to the name (double-clicking on the name will just let you rename the action). You can delete specific steps by selecting them and clicking the ‘Trash’ icon, or record new steps. This example was pretty simple and basic just to familiarize yourself with the process of making actions. Actions are almost limitless, though, so if you need to do something that takes many steps, you can record it and play it back anytime. Side note: You can include actions within other actions. So if you have a basic action and want to add to it, just record the new action and playback the existing action to include it. Go full on Inception with your actions if you want. Actions can be even more useful as they can be applied in batches. 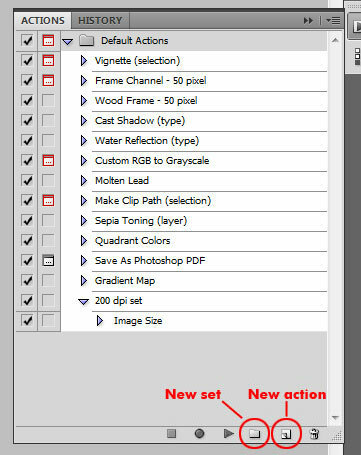 Once you have an action you want to apply to several images, simply go to the ‘Batch’ menu. Select your Action: You have a few options here, the first of which, is which action you want to apply. For this example, I want to use an action that basically sets the contrast and brightness for scanned books and pages so they will be easy to convert to a PDF file and use OCR. 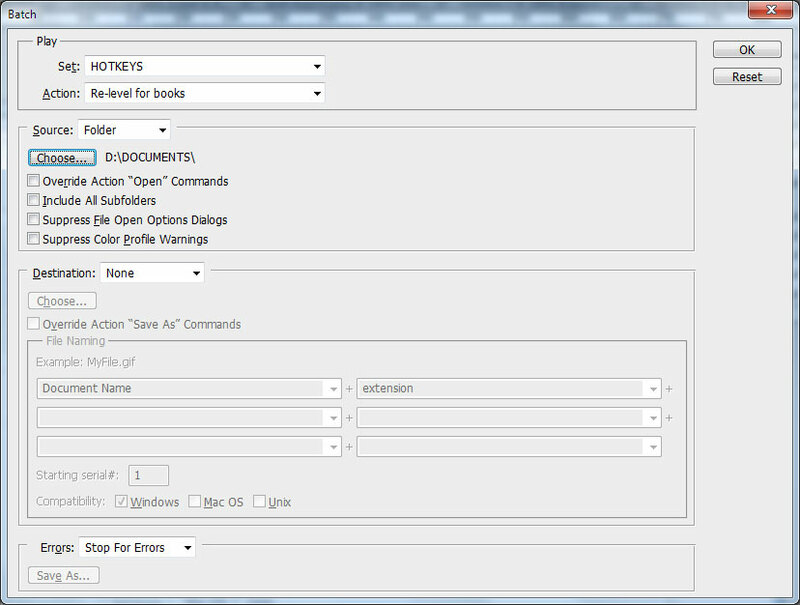 Select your files: The next section is which files you want to apply the action to. You can select a folder, use the currently opened images, or import the images from another application. For this example, we want to choose a folder. If your action includes an ‘Open’ command, select this first option so you don’t get errors. If you want to include all the subfolders, select the second option. If you don’t want to be prompted for ‘open’ dialogs or ‘color’ warnings, check the next two options. Select your destination: As Adobe Photoshop will be opening each file, you can choose what you want it to do after the actions are complete for each image. ‘None’: Simply finish the action and leave the file open. ‘Save and Close’: Overwrite the file and close. Adobe Photoshop will open a file, apply the actions, close the file and repeat until all the files are processed. If you don’t need the originals, use this option. ‘Folder’: Save the files to another folder. Here you can choose another folder and a new filename series. 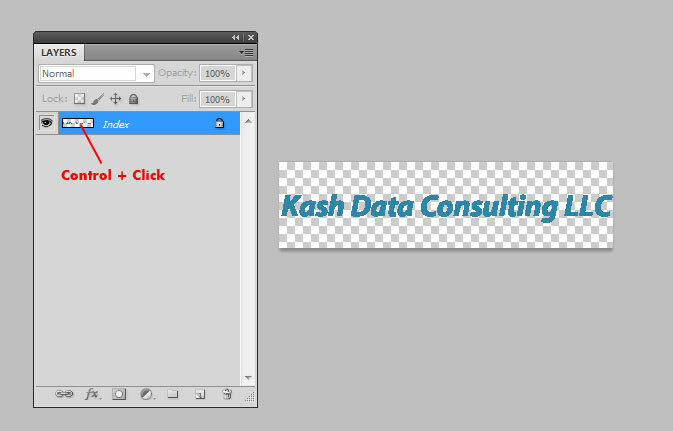 You can have Adobe Photoshop prompt you to name each file with the ‘Save As…’ dialog popping up after each file. Otherwise, check the ‘Override “Save As”’ option and select the automatic naming options. The batch option is fairly straightforward and very useful, especially when you have hundreds of files that all need the same treatment. You don’t need to write your own actions in Adobe Photoshop, of course. Many resources on the web exist with pre-written action sets that you can download, install and start using. Try these resources to browse some complex actions you can use on images and files. Installing is also easy (see link below). Adobe Photoshop: What Makes Photoshop so Great? 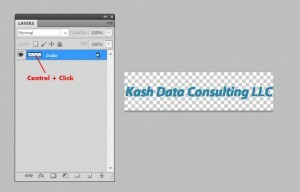 Why to Use Adobe Illustrator When There Is Adobe Photoshop? PDF and Word DOC: Which File Format Is Best and Why?